From her home in the mountains of California, our pal the internationally acclaimed designer Cynthia Rutledge joins us for a weekend of incredible fun and creativity as she debuts three new projects! New for this visit: A Friday night 4 hour mini-workshop! Take one class, or take them all! For out of town visitors we are happy to make lodging recommendations. Our charming shop is located in an historic downtown area, on the shore of Lake Michigan, right between Milwaukee and Chicago. Supply lists will be provided at time of registration. Registrants may purchase kits for the class project directly from Cynthia prior to class. Register for all three workshops and take 10% off the registration fee. To register or for more information call us at 262-634-6088. Inspired by the beautiful lace trims, Renaissance Lace Bracelet evokes a lacelike style, using a right angle weave variation Cynthia developed called lattice weave. Pearl cabochon bezels are linked to each other with seed beads, creating the center of the bracelet. Two Lattice Weave strips, made with seed beads, fire polish beads and crystals are zippered along the edges of the pearl cabochon bezels and show off what Lattice Weave can do in this beautiful bracelet Two pearl cabochon beaded buttons add the finishing touches to this lacey design. The combination is striking! The dimension is 1-3/8 inches wide by desired length using techniques of flat circular peyote stitch with increasing, netting and lattice weave. It is an Intermediate level class. Given the class being held over the dinner hour, we’ll serve pizza and wine! Okay, maybe not the wine til later. Inspired by the work of the famous Bulgari family of goldsmiths and artisans, La Dolce Vita Bracelet, evokes the Greek and Roman heritage of a family that changed how the rich and famous looked at fine jewelry. Their innovative style of using fine gemstones that were not highly cut and faceted and use of mixed metals gained them the prominent position of being one of the world’s finest designers. La Dolce Vita means “the sweet life”. The focal component is 1 inch across. 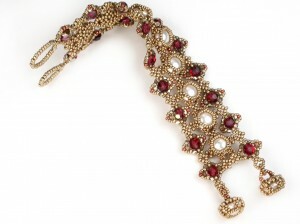 The bracelet width is 5/8 inch and the length is as desired. Sample is 7 1/2 inches long. This is an advanced level class using flat peyote stitch with decreasing on the edge, tubular peyote stitch with increasing and decreasing, step-up/step-down odd count peyote stitch, edge stitching, stitch-in-the-ditch techniques and netting techniques. Simonetta Vespucci (1453-1476) was an Italian noblewoman from Genoa. Renown for being the greatest beauty of her age, Simonetta was known as “La Bella Simonetta”, “The Queen of Beauty” and “The Unparalleled One”, and for many, the Muse of Sandro Botticelli. Examination of his work demands the presence of a Muse. Her likeness is noted in many of his paintings; one of my favorites being “Portrait of a Woman” (c.1480/85). Simonetta is wearing a hairstyle that would be seen on a nymph. The pearls in her hair and the multiple braids become part of her gown, as if to suggest, if her hair was let loose she would be disrobed, revealing a very sensual overtone to the painting. Inspired by the perfection of Sandro Botticelli’s work and by the symbolism eluding from the painting “Portrait of a Woman”, this necklace begins with a braided necklace of SilverSilk that is captured within beaded cones with beaded pearl buttons for the closure. The central component is a large pear shaped CZ set with pearls and Swarovski crystal cup chain. Fern like leaf shapes add the finishing touch, and in total, represent the stylized hairstyles of a nymph by combining braids, pearls and organic material. 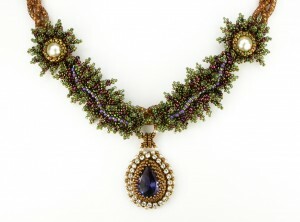 In the end, this necklace is beautiful, alluring and steeped in history. The class level is intermediate.